They're in your phone, in your favourite movies and on your local grocery store shelves – you might be surprised at the places you can find Estonian inventions! You have probably used a product or service from an Estonian inventor before, whether you knew it or not. Tallinn is recognised as a startup capital of Europe, producing some of the most innovative, new software and technology. These modern ideas were preceded by historical inventions that have changed science, technology and business. At the time of its invention in 1936, the Minox subminature camera was the smallest in the world. Designed by Walter Zapp, the device was about the size of a finger. Because of its miniscule size, it became popular with spies – real and fictional. It made an appearance in the James Bond film On Her Majesty's Secret Service (1969), and remains a sought-after collectable among photography enthusiasts. 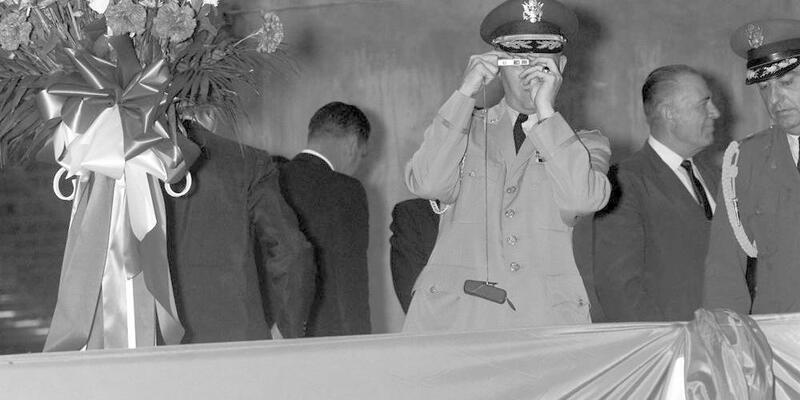 A US Military Aide to the President takes a photograph through a Minox camera in 1962. Skype is used by 300 million users each month, making it perhaps the best-known export of Estonian origin in the world. In fact, 'to Skype' is recognised in some dictionaries as a verb synonymous with video chatting. The software was written in 2003 by three classmates Jaan Tallinn, Ahti Heinla and Priit Kasesalu and would go on to be acquired by Microsoft. Getting packages or pizza delivered by a human may soon become a thing of the past thanks to Starship Technologies' self-driving robots. The little delivery machines on wheels have already hit the streets in UK and US cities to bring orders to customers' doors. The company aims to make local deliveries faster, cheaper and more efficient. Starship Technologies delivery robot going for a drive in a Tallinn suburb. This probiotic lactic acid bacteria, discovered at the University of Tartu in 1995, is the only one in the world to have two sets of patented properties. It has both antimicrobial and antioxidant properties, which are beneficial in food and medicine production. Since 2008, the Estonian company Tere has been licensed to sell dairy products with Lactobacillus fermentum ME-3 in Finland, Sweden, Latvia, Lithuania, Russia and Austria. In the future, this helpful Estonian probiotic may make its way into a yogurt or cheese in your supermarket shelf too! The Estonian government has moved hundreds of services online, from signing documents to filing taxes. These can be performed quickly and easily with a secure, state-issued digital ID card. It may come as no surprise then, that Estonia is the first country to offer e-Residency to anyone in the world. This means prospective business owners can receive an Estonian digital identity, with which they can use government services to run a location-independent company. Notable e-Residents include German Chancellor Angela Merkel, Japanese Prime Minister Shinzo Abe and Prince Andrew, Duke of York.